Don't trust your fine rugs to just anyone in Tampa FL. Have Chem-Dry of Tampa FL clean your fine rugs. We specialize in rug cleaning all over Tampa FL. Our trained technicians understand how to care for your fine rugs. Careful consideration is given to your rug during our cleaning process. We inspect and test your rug to make sure there are no surprises during the cleaning process. We check for hidden issues with color, construction, and fringe damage to make sure your rug come clean without putting them at risk. Our fine rug cleaning service insures that your rugs get the best clean possible without premature aging or color migration. Our rug cleaning solution is not only safe but extremely powerful at removing stubborn soils that have embedded in the rug construction. 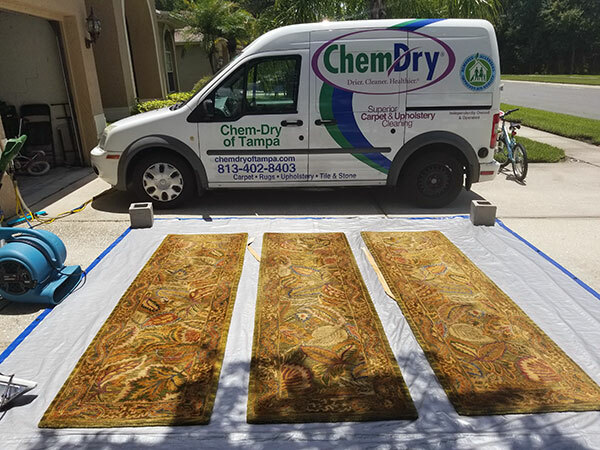 For fine rug cleaning in Tampa FL call Chem-Dry of Tampa.